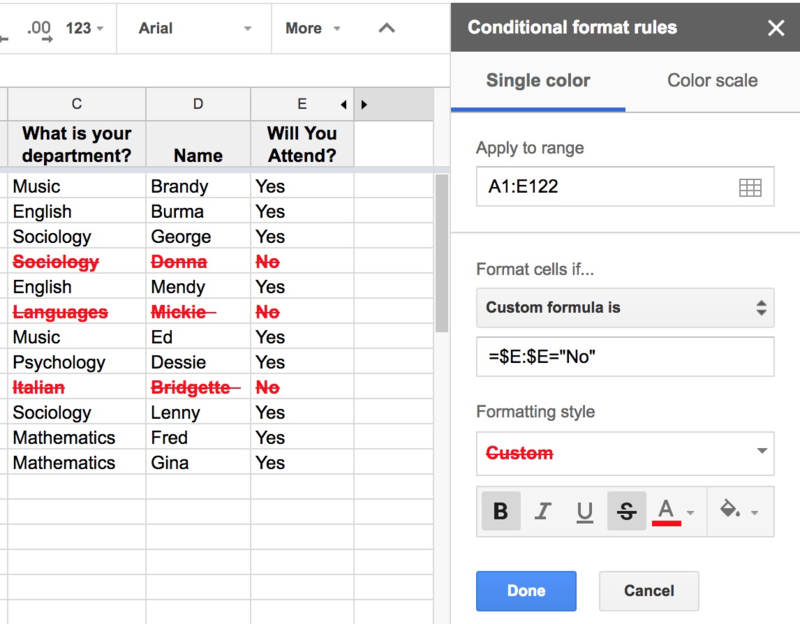 When working with data in spreadsheets, you can use automatic formatting rules (aka conditional formatting) to help make sense of data. Conditional formatting can automatically change font or background color, making spreadsheet data more easily understandable at a glance. *Must know the basics of Google Sheets and Google Drive. With conditional formatting, data that meets a set requirement will display differently than data that doesn't. Data can be crossed off, underlined, bolded, colored, highlighted, etc..
For example, you can set up conditional formatting so that guests who respond that they're not coming to an event are automatically crossed-off. Conditional formatting allows for easy visual comprehension, a tool that is very helpful when dealing with large sets of data.